please send me any information on the dice game that you may have. Nice article. I would appreciate a link to download the excel spreadsheets. Thanks for your interest. Please subscribe to the blog through email or RSS feed and the excel program will be sent to you upon confirmation of the subscription. In order to subscribe through email, simply check the box “Notify me of new posts via email.” below your comment input space. Thank you for this contribution. I would like to receive the file also. INterested in the book and also interested in downloading the excel spreadsheet. Great article! Would love to receive a link to the simulation in Excell. I am a TOC practitioner myself, would come in handy during courses I facilitate to ‘newbees’ to TOC. Very interesting! I’d like to receive the excel simulation if possible. Thnaks! Thanks for your interest. Please subscribe to the blog through email or RSS feed and the excel program will be sent to you upon confirmation of the subscription. In order to subscribe through email, simply check the box “Notify me of new posts via email.” below your comment input space. A email will then sent to you for confirmation. Incorrect numbers: can anyone confirm? I didn’t do more sim’s because if I have these results in the first 12 then it can not be coincidence. Or is it Murphy? Can anyone confirm these results? I have sent you an excel sheet that run the every scenario for 100 times and plot the results. The result can be compare to Little’s Law as well. This should answer your question on the validity of the results. Thanks James, your sheet confirms my results. My simulation seems ok. Thanks a lot for this information. I’ve just finished reading this article and I’d like to have the excel sheet that simulates the dice game. thanks for your interest. The spreadsheet will be sent to you upon the confirmation of your subscriptions to the blog. Thanks very much – best description I’ve seen so far! Nicely written summary. Thank You! Great information here. I just finished reading both The Goal and Velocity and think you have an ideal summarization of the theory. I would love to have the spreadsheets to do the Dice game. Would you please send them to me? Please confirm your subscription tot the blog and the spreadsheet will be sent to you. Thanks for your interest. Thanks for your interest. Please confirm your subscription to the blog and the spreadsheet will be sent to you. In scenario two, it is said they are adding a constraint. In fact, what was done was that every other station doubled capacity and Murphy’s station remained at same capacity as before. What would total throughput be if Murphy’s capacity were doubled as well. I would assume that WIP would not be as high. If anyone has indepth knowledge of TOC, please let me know if my assumptions are correct. The amount of WIP depends on the variability (measured by standard deviation) of the performance at each work station. 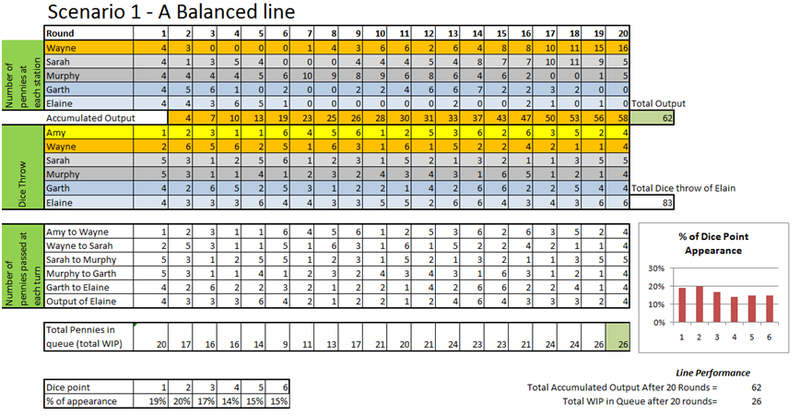 Increasing the capacity by allowing each station to cast 2 dice (varing from 1-12 instead of varying from 1-6 uniformly) will increase the overall variability and henece will increase not only the throughput but the average amount of WIP in the system. 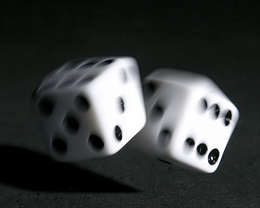 can you please send me the spreadsheet for the dice game simulation? thanks for you interest. Please subscrib to the blog in order to have to the spreadsheet sent to you. excelent article. I “discovered” TOC a few years ago and I’m still enthusiasted with it. Velocity was also my last reading on TOC. PLease subscribe to the blog. the spreadsheet will then be sent to you. thanks for your interest. I would love a copy of the Velocity Penny/Dice Game Excel File! The article is really well crafted and practical! I would like to subscribe to the blog. I had great success implementing TOC in my last position. I am looking for a way to show the entire velocity idea to my new team. This spreadsheet would save me hours. Thank you. Lost track on whether I have sent it to you. Let me know if I have not. Loved ‘Velocity.’ Especially excited to demonstrate the simulation game to others. We have started a tranformation based on the principles of this book. Interesting. Share you transformation story when you have a chance. Hope it was successful. We are going through a similar problem and solution now where we balanced our production line, but variation is causing us to fall off schedule. I am attempting to identify how to find the constraint, buffer it and use six sigma to minimize variation in it. I will definetly use this simulation next week to help explain my concepts. Thanks for the breakdown from the book. Very interesting approach and well written. I look forward to having the spreadsheets to use. A very nice Illustration of the theory. Thanks for putting this together. We are using this for an Operations meeting during our Lean discussion. I would like a copy of this spreadsheet. Thanks!